If the world events that have unfolded thus far in 2017 were to be described in a single word, “tumultuous” would be a strong candidate. Some of the disheartening and grim events of 2017 include: political gridlock and infighting, heightened nuclear missile tensions with North Korea, the unprecedented WannaCry global cyberattack, the massive Equifax data breach, three category four hurricanes (Harvey, Irma and Maria), heightened racial tensions, the Las Vegas strip mass shooting, and Syria’s continuing civil war that has created the largest humanitarian crisis our world has faced since World War II. Sadly, this is not an exhaustive list. The challenges associated with these events are immense and ongoing. For investors, this only increases uncertainty and stokes fears about the future and the stock market. But it also presents an interesting question: If you had perfect foresight of all the events referenced above prior to 2017, would you have maintained your portfolio allocation to stocks? The fact is, 2017 has been an outstanding year for stocks. Through the third quarter, U.S stocks (S&P 500) delivered 14.2%, while foreign stocks (MSCI ACWI ex USA) have done even better at 21.1%. The Latin phrase above is a logical fallacy that states “since event Y followed event X, event Y must have been caused by event X.” The fallacy lies in drawing a conclusion based on the order of obvious events, rather than considering other factors potentially responsible for the result. Investors, and the financial media, often fall victim to this fallacy when seeking to explain stock market movements. It’s natural to assume that the market is a direct reflection of the day’s headlines. This is why 2017 has proved so confounding for many – the news headlines and the stock market often seem to be moving in opposite directions. The disconnect lies in the fact that headlines you see featured are prioritized for their drama, not for their significance to stock prices. For example, the most impactful news for stocks this year is that this is the most stable and synchronized worldwide economic growth we’ve experienced in a long time. The U.S. economy has been steadily growing for the last eight years, and we may see an additional pickup in pace from fiscal stimulus and rebuilding after the hurricanes. In light of the world events, the chief fear of many investors today is investing at the “top of the market.” Coincidentally, October marks the 10th anniversary of the beginning of the global financial crisis. From its October 2007 peak, the U.S. stock market lost more than half its value. Imagine you were unlucky enough to invest your entire portfolio at the top of the market. Would you be ruined financially? Would you spend each day regretting your ill-timed decision? You might be surprised by the answer – you’d be just fine. 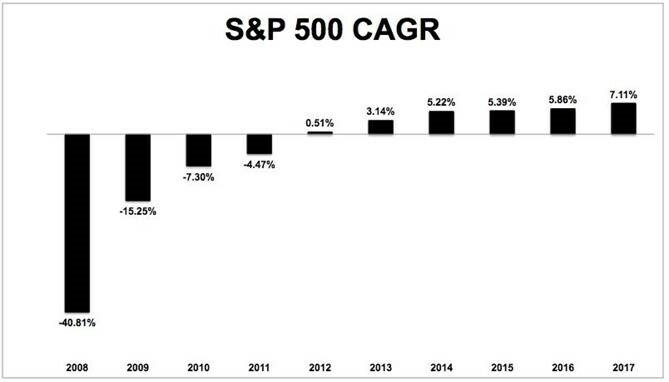 The graphic below shows the compound annual growth rate (CAGR) of a portfolio invested in the S&P 500 at exactly the peak of the market in 2007. Over the coming weeks and months, there will likely be a steady stream of retrospectives on the financial crisis, as well as commentary on how today’s environment compares. It is difficult to draw useful conclusions based on such observations; financial markets have a habit of behaving unpredictably in the short run. There are, however, important lessons that investors are well-served to remember: Capital markets have rewarded investors over the long term, and having an investment approach you can stick with – especially during tough times – is the key determinant of investment success. Speaking of 10-year anniversaries, there’s one more approaching that is worthy of acknowledgement. The Oracle of Omaha, Warren Buffett, wagered $1 million at the start of 2008 that a low-cost S&P 500 index fund would outperform a group of hedge funds selected by manager Ted Seides. Buffett used the bet to clearly emphasize his belief in the power of index funds over more “sophisticated” investment strategies. And the timing of the bet was key: the financial crisis provided ample opportunity for the hedge fund managers to sidestep the market trouble that the index fund simply had to endure. Even though the bet won’t officially end until December 31, Buffett is so far ahead that Seides has conceded defeat. While the S&P 500 gained more than 7% per year (see chart above), Seides’ funds have only gained 2.2% per year. When compounded, the dollar difference in gains on the $1 million bet through 2016 was more than $600,000. The outcome is not because hedge fund managers aren’t intelligent, well-informed and hardworking – they are. The flaw this bet exposed is the mistaken belief that being intelligent, well-informed and hardworking equates to an ability to outwit the collective wisdom of the market. Typically, efforts to outwit the market simply detract value, which is exactly what happened here. Although 2017 has been a tremendous year for investors thus far, there is always a “crisis of the day” or potential major event looming that could spark a market decline. As we’ve always known, attempting to predict future events, and how those events will impact the market, is a fool’s errand. Allow this year to further solidify that belief for you. To capture the higher long-term returns of stocks, investors must be willing to accept constant near-term uncertainty. A well‑thought‑out investment approach better prepares investors to face uncertainty and improves their ability to stick with their plan during tough times. And tough times needn’t be defined simply by bad markets. Tough times can be anything that causes you to doubt your philosophy or stray from your discipline. As always, we will be there to help you remain disciplined regardless of what the challenge may be.